Count Strange Music 2 for 2 in 2014’s Dope Album category. 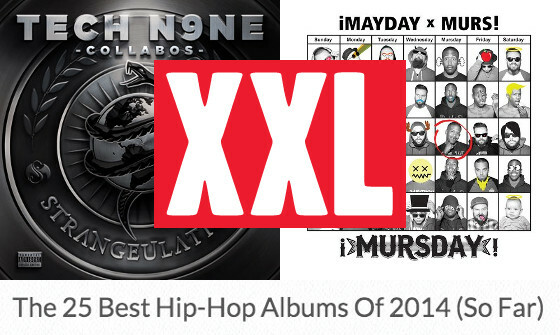 XXL recognized the quality output of the Snake and Bat in their article of “The 25 Best Hip-Hop Albums of 2014 (So Far).” Making the list was none other than Tech N9ne Collabos – Strangeulation and ¡MAYDAY! x MURS – ¡MURSDAY!, the only two full-length releases from Strange Music so far this year. It seems like the further Tech N9ne goes in his career, the better he becomes. It’s no doubt he’s one of the most successful independent artists in the genre, and this fourth installment in his Collabos series—his fourteenth studio album overall—follows up his previous effort, last summer’s Something Else. The album delivers a very aggressive tone throughout, but what makes this project different from other releases in 2014 is Tech’s ability to deliver diverse lyrics over heavy instrumentals with songs like “Make Waves,” while sustaining a mainstream presence with songs such as “Great Night.” Aside from his solo tracks, Tech brings together his Strange Music family (including newcomer Murs) to show off their talent to newcomers unfamiliar with the label. Tech knows how to showcase Strange in the best possible way, and he achieves that again on Strangeulation. In a strategy that highlights Strange Music’s group mentality, latest signee Murs’ first release on the label came in the form of a collaboration with ¡Mayday! Aptly titled ¡MursDay!, the album sees Murs trade rhymes with ¡Mayday! MCs Wrekonize and Bernz, in an old school freewheeling manner that’s indicative of their shared charisma. Murs retains his comedic stylings, Bernz shows his strength in delivery, and Wrekonize comes across as extremely relatable. They’re all likeable personalities on the mic, and each knows how to inject wordplay in frequent intervals. The ¡Mayday! band emerged as the real star of the project, creating a sonic landscape that plays almost like a live show. There are impressive horns and atypical drums, flamenco hand claps and insanely catchy hooks. The Latin flavor is coupled with some hints of rock and West Coast swag. It’s all a welcome departure from the norm, while utilizing scratch techniques and reliable rhymes to retain a level of accessibility for hip-hop purists. A “summer album” that’s inhabited by quality MC skills and old school thematics is hard to come by. ¡MursDay! delivers exactly that. What’d you think of the list?